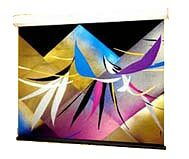 A heavy-duty spring roller projection screen which can be mounted on wall or ceiling. The Luma 2 is an attractive and practical choice wherever a large spring-roller screen is required. Simple in design and rugged in construction, it is housed in a white steel case with matching endcaps.